It's A Real Gun. A Real Halo-Themed Gun, That Is. 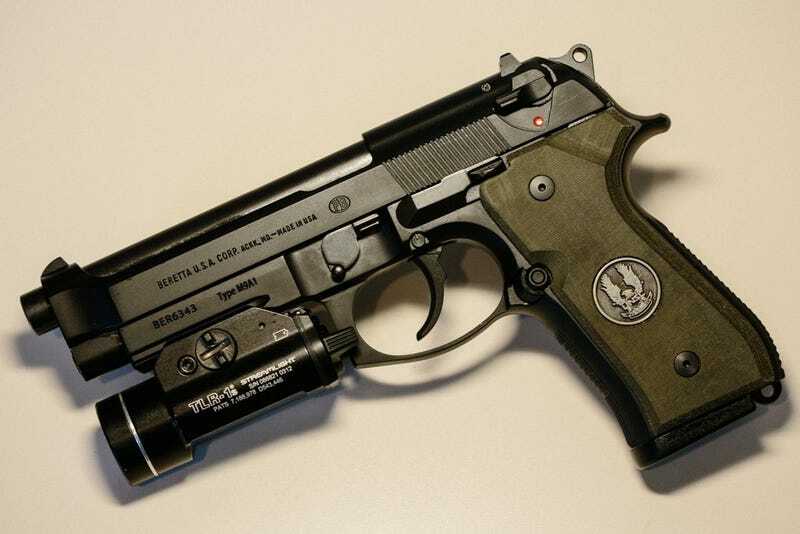 This is nothing like those branded Halo bullets we covered a while back: ucfnate's Halo Beretta M9A1 is custom. While I'm not into real-life guns myself, dang if this isn't well-made.Not only are the grips UNSC, but they also glow in the dark. The grips cost 120 dollars, and they were made by DS Grips. "We chose a color and angles that were inspired by Master Chief's armor, then....found a UNSC emblem to go with it. On the flip side, there is a halo-shaped (a ring basically) epoxy inlay that glows blue in the dark, which matches the color of cortana almost perfectly," ucfnate wrote on Reddit.